The Lesotho team spent a few days in January developing a new strategy and better understanding each other’s strengths and weaknesses. With a combination of challenges, including rope swings, and bridges, and spaghetti bridge building, Heather got our creative juices flowing. The two days culminated with some intense brainstorming sessions which generated in excess of 100 ideas for the team to investigate back at the office. These type of events always bring surprises and help us reset some of our basic expectations. People that you wouldn’t expect to be scared of a dog or a rope climb struggle, people you think might give up often persevere. These events help us recognise that people are dynamic, intricate and often have complex motivations for why they do what they do. At the end of February I was lucky enough to shown one of my colleagues favorite places in Lesotho, Qulalane Falls. The only condition was that I take her on the back of the bike over the two mountain passes that had to be crossed to get to the hike starting point . We set out early from Maseru on a sunny Saturday, with two other friends joining in a car to make a convoy of it. The pictures below show the hike in, and the falls. What they do not show is the thunderstorm that rolled in while we hiked back after lunch. They don’t show the hail, flash flooded roads, lightning and thunder. Most spectacular and scary of all was the fountains created as rain water poured down the gutters and hit piles of rocks in its path, spraying water 2 meters in the air and all over the road. The bad weather created an interesting moral dilemma. It placed me in a position where I felt that it was an unnecessarily high risk for my colleague to ride on the back of the bike. Especially given there was room in the dry, warm, comparatively safer car, and my colleague did not have a proper jacket. My colleague disagreed, passionately, so I drove off without her, removing her freedom of choice. Was this right or wrong? * Not sure about spelling. Suggestions welcome! Chiba prefecture and Ibaraki prefecture have been two of my favourite spots for a quick weekend ride. They are easy to get too, offer quiet twisty roads, cute seaside towns, beachs and sunshine. Great relief from Tokyo. Stories and pictures from my three trips to this are are below. One rainy day I did a day tour of the Boso peninsular by train, never bothering to leave the station. The whole round trip from Tokyo cost me and my friend only a local fare and provided great views of thundering surf, and wind swept waves – all from the comfort of a warmed train carriage. Thats how I like to ride in the wet! You can see some of the photos from that trip in Golden week on this post. One quick weekend trip to Ibaraki did not go so well. It was October and damn cold despite being sunny. My gloves at the time did not cope well. I was heading to Oarai but before arriving stopped to warm my hands and belly at this family restaurant ‎. Once I got talking to them and they found out I did not have a reservation for the night they promptly freaked out and started calling all the hotels in Oarai to see if there were free rooms. Little did I know or understand at the time that the Oarai marathon was on the next day! Every sold out hotel was met with shrieks and tut-tuts worthy of any mother. Eventually a room was found for me in hotel sawaya in Hokota and I was led their by some departing customers! The next day I did get to sit on the beach in beautiful sunshine around Konaji. 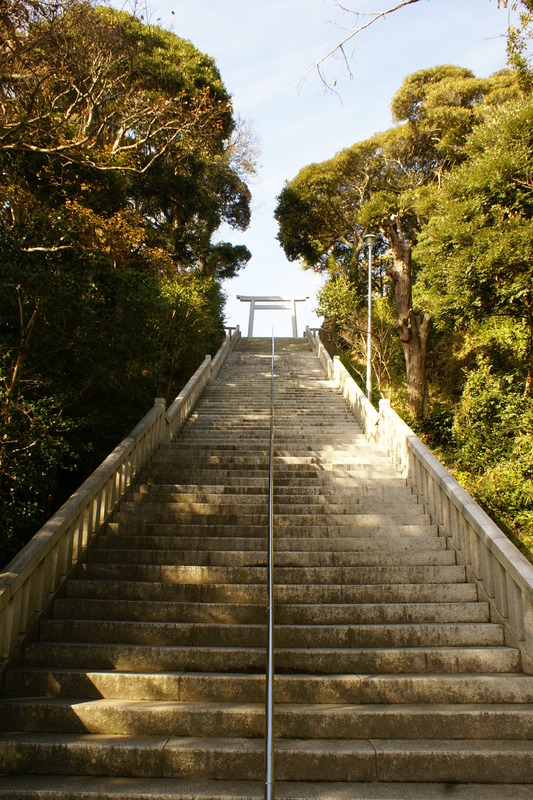 Eventually though I made it to Oarai and spend some time at the Oaraiisosaki Shrine (oarai-isosakijinja.or.jp‎) before going a little further up the coast to have lunch by the beach in Ajigaura (阿字ケ浦海水浴場 more info ‎) and head back to Tokyo on the Higashi-Mito Express-way. All was fine and wonderful for the whole weekend until I stopped about at a road-side stop on the expressway and when returning to the bike, it would not start. The neutral light, oil light and temperature light did not even come on when the ignition was on. How could I have a flat battery after 2 days of riding? Eventually I found the answer was that my regulator had blown and was pumping 18v in the battery, which killed it too! That night I had to catch a train home and come back with a mini truck a few days later to pick-up the bike! Ah, adventures! My most recent trip was in March and I shot down to the Boso peninsular using the Tokyo Aqua line and stopping off in the middle of the bay‎ for some nice photos and a Mt Fuji bread roll. That weekend we managed to get down to Tateyama and visit the Sunosaki lighthouse, the Boso flower line in Konuma and enjoy some local hospitality, especially on our way back at CLs Cafe in Katsuyama (スナックブルーマリン). We stopped in this little seaside cafe for an hour or two for breakfast on the Sunday. The collection of books and photagraphy magazines and the general homeliness of a place that seems in the middle of nowhere was brilliant. You can read the owners blog, mostly in Japanese, here. The place is well worth a visit as you can hopefully see from the pics. On the ride home that Sunday morning we were joined by a Harley motorbike club for a few kilometers, along the cliffs of Route 127, the Uchibo-Nagisa Line prior to rejoing the Tateyama Expressway via route 237 in Kanaya. The ride back over the Tokyo Aqua line bridge in strong winds was one of the scariest I have done, with the gusts pushing the bike side-ways, making it hard to maintain balance and line. The leader of the pack… well clear. Tokyo bay aqua line bridge – a scary proposition for a motorbike in high winds. Sunny but still a little chilly. BYO lunch at the half-way station. the half-way station is designed like a ship. Tokyo Bay aqua line half-way station. View back towards Kawasaki. The cone in the middle is an air vent and solar power generator. Mt Fuji muffin cake, filled with custard… sometimes BYO is not enough! Lots of Dr Zeus books! Hotel Sawaya traditional room. Love the symmetry and simplicity of these rooms. One day after arriving back in Japan from Sydney I was off on another adventure with some of the Wommies. paintballing at War-Zone in Chiba.